Jill Biden believes in the power of a story. She also believes in the power of military children. Hearing the story of a young girl’s sorrow over losing her military father inspired Biden, wife of Vice President Joe Biden, to form the initiative that became Operation Educate the Educators, a program to encourage colleges to train new teachers to recognize the particular stresses military life places on children. 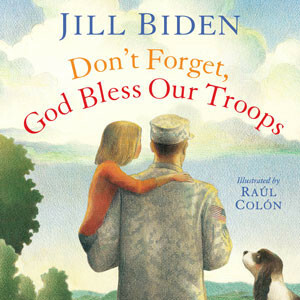 The story of Biden’s own grandchildren coping with the deployment of their father, the Bidens’ son Beau who serves in the Delaware Army National Guard, inspired Jill Biden to write Don’t Forget, God Bless Our Troops. 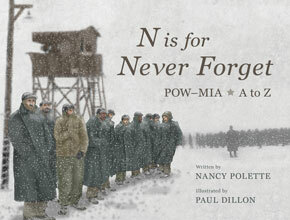 The children’s picture book is about her military family’s experience, but Biden said she wrote the book for civilians. Dr. Biden, a career educator, currently teaches English at a community college near Washington, DC, so it’s natural that she wants Don’t’ Forget, God Bless Our Troops to make a difference for military students. Biden has used her platform to encourage national support for military families through the Joining Forces initiative, alongside First Lady Michelle Obama. Biden’s personal connection to the military lends credence to her message, and her influence extends it to a wider audience. Biden knows the difference books can make in the life of a child, having come from a family who loved books. Her voice is strong and clear when she discusses her initiatives for education and military families. It softens and warms when she begins speaking about the books that enriched her childhood and the women who read to her. “My life was full of books,” she says. The girl who read late into the night now encourages her students to be readers and writers. “As a writing teacher, I feel there’s such a strong connection between reading and writing. My students who have been readers are much better at writing because they’ve seen the written word. 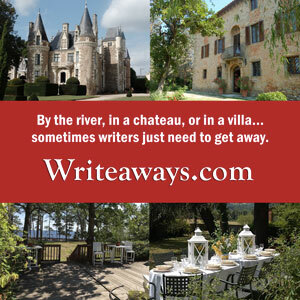 They’ve seen the structure, they know and hear a good sentence,” she says, and there are more esoteric benefits as well. An eager learner as well as a teacher, Biden said she listens to other writers to enrich her own storytelling skills. Biden said the positive experience of writing her first book makes the idea of creating another one appealing. Feature photo by Chuck Thomas, Old Dominion University. Dr. Biden hugs Jaelin Franco, a 9-year-old fourth-grader and military child, from Lee Hall Elementary School after Jaelin introduced Dr. Biden. Jill Biden portrait by Dennis Drenner. Terri Barnes is a military wife, mother of three, and author of Spouse Calls: Messages From a Military Life. Connect with Terri on Facebook and Twitter. Great article, Terri. Congrats on the interview with Dr. Jill Biden. I love the cover of her new book! I can’t believe that Jill Biden and I share such a love for reading (Nancy Drew was the catalyst for my library trips) and writing…how cool to read this article on her!